A thyroid nodule refers to any abnormal growth of thyroid tissue that forms a lump within the thyroid gland. A nodule that is filled with fluid is called a thyroid cyst. Approximately 2/3 of thyroid nodules are solid and 1/3 are cystic. Thyroid nodules are the most common endocrine problems. The prevalence of the thyroid nodule is 1 in 10 people. What are the types of the thyroid nodules? More than 90% of the thyroid nodules are benign and they are rarely a threat to life. Benign nodules do not invade the tissue around them or spread to other parts of the body. If there are symptoms the treatment is surgical removal. They invade surrounding tissues and organs. Can spread to other parts of the body and may sometimes be a threat to life. Treatment is to destroy surgically or by radiology. Based on how thyroid cancer looks under the microscope, it is divided into four types: papillary, follicular, medullary and anaplastic. What are the symptoms of a thyroid nodule? Most thyroid nodules do not cause symptoms and are initially discovered during a routine physical examination, or the patient may discover a lump in the neck. 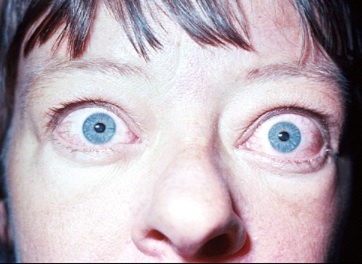 Symptoms of elevated thyroid hormone (hyperthyroidism) in nodules that produce an excessive amount of thyroid hormone. The most common symptom would be an increased heart rate (rapid pulse), tremor in the fingers, and bulging eyes. Symptoms of decreased thyroid hormone (hypothyroidism), due to a painful inflammation of the thyroid or iodine deficiency. Symptoms caused by compression of adjacent organs, including neck pain, difficulty in swallowing from compression of the pharynx and oesophagus, and difficulty in breathing due to compression the windpipe (trachea). 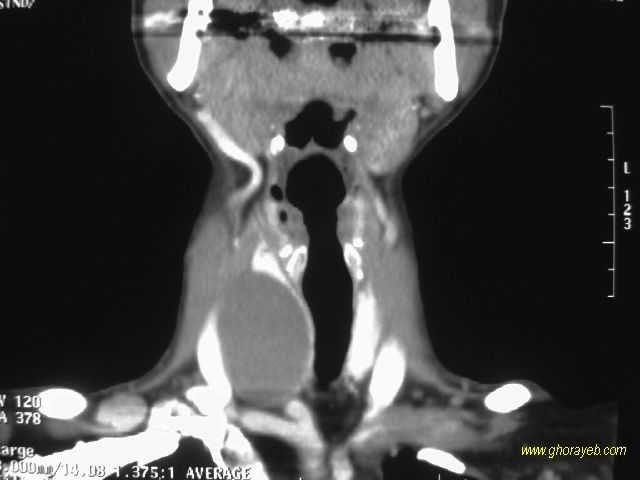 Coronal CT scan (patient on left) showing the displacement of the trachea by the thyroid cystic nodule.